After several years planning and several months working we have now planted our willow labyrinth and we invite folk to come and visit and walk it. Access is still not ideal but if you wish to visit, please contact us first and we can arrange to meet and direct you. Further pages under the menu items will eventually tell the story of the development of the whole concept and the design of the labyrinth as it now grows and a photo gallery, which we will expand as the willow grows and is harvested. We will also include a bit of general and historical back ground to labyrinths. 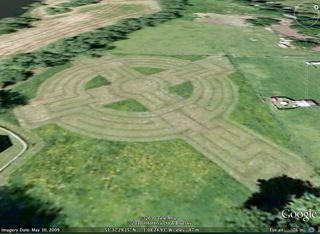 Our Labyrinth is in the shape of a Celtic Cross and the Meditation spaces will be based on broadly Christian understandings of life and relationship with God, the spiritual realms and the world at large. We do hope and pray, however, that no matter what your faith you will find that walking the labyrinth can be a special and profound experience. 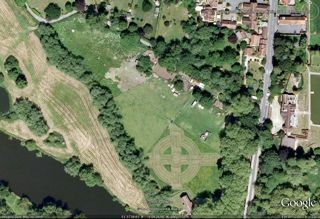 Latest news - We are on Google Earth!!! We hope you enjoy the pages on the website but also look forward to seeing you at Bridge House sometime. 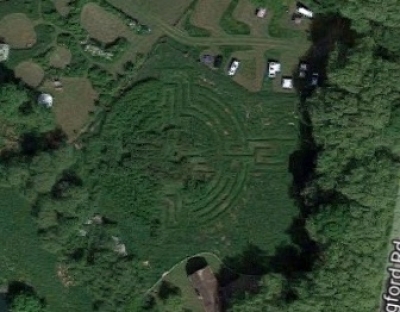 Click on date to view gallery of Labyrinth Photos to date.